Patients with skin and soft tissue wounds commonly present to the emergency department (ED) for evaluation and treatment. Essential in the evaluation of these wounds is a careful assessment for retained foreign bodies (FB), as they are frequently missed on initial evaluation. [1, 2] Identification of a foreign body can be difficult, depending on the type and location of the wound and the timing and mechanism of injury. Soft tissue foreign bodies most commonly occur secondary to penetrating or abrasive trauma, and they can result in patient discomfort, deformity, delayed wound healing, localized and systemic infection, and further trauma during attempts at removal. [1, 3, 4] See images below for examples of foreign body presentations. 3-mm hole in patient forearm (entrance). Author strategy for traumatic nail removal. Cast cutter was used to remove shoe through which nail was embedded. Following placement of a nerve block, the nail was then cut at the surface of the foot with bolt cutter and removed with steady pulling, with remaining nail fragment traveling from plantar to dorsal foot surface. See Foreign Bodies: Curious Findings, a Critical Images slideshow, to help identify various foreign objects and determine appropriate interventions and treatment options. Assessment of a patient with a suspected foreign body begins with a careful history and physical examination. Patients who present with a wound or localized pain following trauma should be questioned regarding the specific timing and nature of the injury, the level of wound contamination, and any materials involved in the injury (eg, wood splinters, shattered glass, shredded metal). Foreign bodies detected in the ED are most commonly composed of wood, glass, or metal. A careful assessment of the patient’s current symptoms should be made, including the location, quality, severity, and radiation of pain; the presence of a foreign body sensation; swelling, warmth, or redness to the wound; and any neurologic symptoms (including motor or sensory deficits). Injuries involving the hands mandate asking about hand dominance, patient occupation, and previous hand injuries. As with any clinical scenario in emergency medicine, complete evaluation of airway, breathing, and circulation (ABCs) is most important. Prior to wound examination, maximize lighting and patient positioning. Physical examination of the affected area should adequately assess for nerve, tendon, vessel, and joint involvement. Perform a vascular assessment focusing on color, capillary refill, and palpation of distal pulses. A neurologic examination should include testing of the surrounding and distally distributed nerves and assessing 2-point discrimination. Evaluate functional status, concentrating on potentially involved muscles, tendons, and joints. [1, 4] A functional assessment of movement helps to refine the potential musculoskeletal damage that may have occurred during injury and FB deposition. A complete physical examination should be performed to avoid missing any other injuries. Lidocaine (with or without epinephrine), bupivacaine, and topical creams such as LET (lidocaine-epinephrine-tetracaine) or EMLA (eutectic mixture of local anesthetics) are useful in creating anesthesia at the site of exploration or removal. [14, 30] Topical anesthetics may also be used for patients with aversions to needles (eg, small children) or as an adjunct to pain management. For more information, see Medscape Drugs & Diseases topics Infiltrative Administration of Local Anesthetic Agents and Topical Anesthesia. The field block and nerve distribution blocks at the sites of the wrist and ankle and at the bases of fingers or toes are useful anesthetic application options to consider prior to an extensive evaluation or removal attempt. Field blocks that surround the site of a splinter or staple entrance are essential for pain management during the procedure. A digital nerve block facilitates the removal of a fishhook through a finger and also helps in postprocedure pain management. For detailed descriptions of various nerve blocks, please visit the Anesthetic and Analgesic Techniques section of the Medscape Drugs & Diseases Clinical Procedures journal. Procedural sedation and anesthesia (PSA) can be used as an adjunct to local anesthesia. PSA is useful for foreign body removal as a means of decreasing pain and discomfort during wound assessment, cleansing, and foreign body retrieval in more painful and extensive wounds. PSA is also useful in special patient populations such as children, uncooperative patients, or patients with wounds that cannot be properly explored with local anesthesia alone. [5, 32, 33] Before performing procedural sedation, review recommendations on patient monitoring, dosages, adverse effects, and medication profiles. For more information, see Medscape Drugs & Diseases topic Procedural Sedation. Obtain and document informed consent for the potential of future infection, pain, disability, retained foreign body, and other possible complications. Perform and document a detailed neurovascular examination and functional assessment. Achieve adequate pain management with a patient-appropriate combination of systemic and local analgesia (see image below). Placement of ankle nerve block for traumatic nail removal. Irrigate the wound with pressurized normal saline. If the wound is open, explore and remove foreign bodies as identified (see image below). If closed, use incisions, blunt dissection, and other methods that cause minimal tissue deformation. Nail embedded in the foot, propelled by nail gun through soft tissue and bone. While dissecting, use good surgical site hemostasis (eg, electrocautery, suture, lidocaine with epinephrine) to create a bloodless field. Perform and document a postprocedural neurovascular examination and functional assessment (see image below). 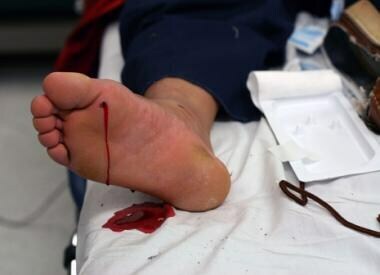 Patient's foot following nail removal. The patient suffered no acute complications. Consider antibiotic prophylaxis for excessively contaminated wounds or in patients who are at risk for infection (eg, patients with diabetes mellitus, HIV/AIDS, peripheral vascular disease, or immunocompromise). Update the patient’s tetanus status, as needed. Document the foreign body removal using a standardized procedure note. Provide detailed follow-up care instructions and oral analgesics, as needed. Avoid needless tissue trauma in search of doubtful or inert foreign bodies. A good rule of thumb maybe to restrict wound exploration to half an hour. Irrigate and explore the wound for foreign bodies after adequate anesthesia has been obtained. This provides comfort for the patient, as pain is a barrier to complete wound exploration. In the event of a failed retrieval of the foreign body despite a high index of suspicion, proper documentation and plans should be made for future reassessment or specialist referral. Radiologic evaluation of soft tissue injuries plays an important role in detecting, evaluating, and planning the potential removal of a foreign body. If clinical suspicion is high, imaging serves as an essential tool in management when no foreign body is found on examination and exploration. When choosing an imaging modality, consider the need for real-time imaging or to evaluate nearby structures, such as vessels, nerves, tendons, and bones. Depending on the modality chosen, important information may be available about the position of the foreign body, nearby structures, and surrounding tissue reactions. It is also important to consider radiation exposure, particularly as ultrasound is a safe, noninvasive, and inexpensive imaging option. History of the injury is particularly important, as the material type of the foreign body may assist in imaging modality selection. Radiographs are considered an adjunct to visual inspection and are often an integral part of foreign body evaluation. They are noninvasive, inexpensive, widely available, easy to interpret, and they can provide positional information (although not in real time) to aid in foreign body removal. [30, 31, 65, 66, 67] See images below. 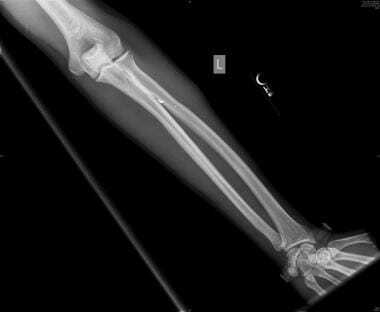 Anteroposterior radiograph depicting foreign body projectile fragments in a patient's forearm. 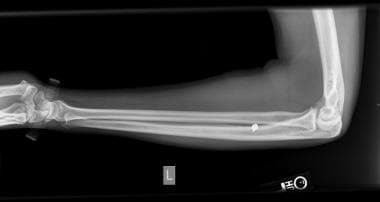 Lateral radiograph depicting foreign body projectile fragments in a patient's forearm. 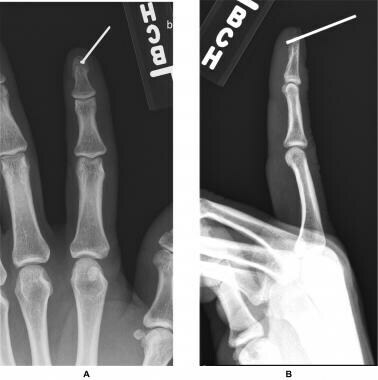 Anteroposterior (panel A) and lateral (panel B) radiographs of the left index finger demonstrating a nail embedded in the distal phalanx following a nail gun injury. If appropriate radiolucent surface markers are used prior to the radiograph (ie, 2 surface paper clips, one in the anteroposterior and the other in the lateral plane), positional information of the foreign body relative to the surface markers can be used if retrieval is planned. [48, 49] At least 2 radiographic views (ie, anteroposterior and lateral) are likely sufficient in most cases for adequate foreign body localization. Radiographs can also provide detailed information on the potential number of foreign bodies present (and their absolute or relative sizes), which can be used when determining appropriate irrigation, exploration techniques, and the need for postprocedure antibiotic prophylaxis. Postextraction radiographs may detect any split fragments. The use of bedside ultrasonography to detect and localize soft tissue foreign bodies in the ED is gaining in acceptance and popularity because of its ease of use, increased availability, lack of radiation exposure, safety, and sensitivity with detection of certain types of foreign bodies. [49, 53, 54, 63, 58, 72] See images below. 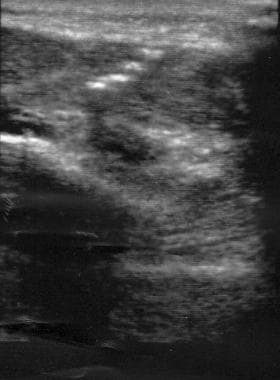 Ultrasound of projectile foreign body fragments in a patient's forearm. Ultrasonographic guidance (active) of retrieval of projectile foreign body fragments in patient forearm. Note tissue tenting at tip of forceps used to retrieve the most superficial fragment. 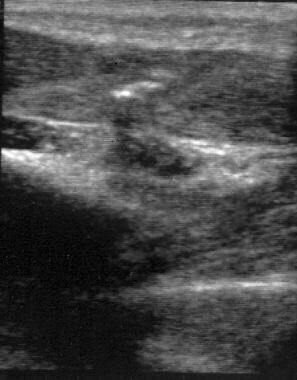 Ultrasound of remaining projectile foreign body fragments in patient forearm after active ultrasound-guided removal of the most superficial fragment. Anderson MA, Newmeyer WL 3rd, Kilgore ES Jr. Diagnosis and treatment of retained foreign bodies in the hand. Am J Surg. 1982 Jul. 144(1):63-7. [Medline]. Hollander JE, Singer AJ, Valentine SM, Shofer FS. Risk factors for infection in patients with traumatic lacerations. Acad Emerg Med. 2001 Jul. 8(7):716-20. [Medline]. Stone DB, Koutouzis TK. Foreign body removal. Roberts JR, Hedges JR, Chanmugam AS, et al. Clinical Procedures in Emergency Medicine. 4th ed. Philadelphia, Pa: Saunders; 2004. Chap 37; 694-715. Pfaff JA, Moore GP. Reducing risk in emergency department wound management. Emerg Med Clin North Am. 2007 Feb. 25(1):189-201. [Medline]. Levine MR, Gorman SM, Young CF, Courtney DM. Clinical characteristics and management of wound foreign bodies in the ED. Am J Emerg Med. 2008 Oct. 26(8):918-22. [Medline]. Hollander JE, Singer AJ. Laceration management. Ann Emerg Med. 1999 Sep. 34(3):356-67. [Medline]. Cruse PJ, Foord R. A five-year prospective study of 23,649 surgical wounds. Arch Surg. 1973 Aug. 107(2):206-10. [Medline]. Baker MD, Lanuti M. The management and outcome of lacerations in urban children. Ann Emerg Med. 1990 Sep. 19(9):1001-5. [Medline]. Singer AJ, Hollander JE, Quinn JV. Evaluation and management of traumatic lacerations. N Engl J Med. 1997 Oct 16. 337(16):1142-8. [Medline]. Singer AJ, Quinn JV, Thode HC Jr, Hollander JE. Determinants of poor outcome after laceration and surgical incision repair. Plast Reconstr Surg. 2002 Aug. 110(2):429-35; discussion 436-7. [Medline]. Vermeiren B, De Maeseneer M. Medicolegal aspects of penetrating hand and foot trauma: ultrasound of soft tissue foreign bodies. JBR-BTR. 2004 Jul-Aug. 87(4):205-6. [Medline]. Chan C, Salam GA. Splinter removal. Am Fam Physician. 2003 Jun 15. 67(12):2557-62. [Medline]. Lammers RL, Magill T. Detection and management of foreign bodies in soft tissue. Emerg Med Clin North Am. 1992 Nov. 10(4):767-81. [Medline]. Walters TJ, Wenke JC, Kauvar DS, McManus JG, Holcomb JB, Baer DG. Effectiveness of self-applied tourniquets in human volunteers. Prehosp Emerg Care. 2005 Oct-Dec. 9(4):416-22. [Medline]. Wedmore I, McManus JG, Pusateri AE, Holcomb JB. A special report on the chitosan-based hemostatic dressing: experience in current combat operations. J Trauma. 2006 Mar. 60(3):655-8. [Medline]. Pusateri AE, Modrow HE, Harris RA, Holcomb JB, Hess JR, Mosebar RH, et al. Advanced hemostatic dressing development program: animal model selection criteria and results of a study of nine hemostatic dressings in a model of severe large venous hemorrhage and hepatic injury in Swine. J Trauma. 2003 Sep. 55(3):518-26. [Medline]. Dubay DA, Franz MG. Acute wound healing: the biology of acute wound failure. Surg Clin North Am. 2003 Jun. 83(3):463-81. [Medline]. Eylon S, Mosheiff R, Liebergall M, et al. Delayed reaction to shrapnel retained in soft tissue. Injury. 2005 Feb. 36(2):275-81. [Medline]. Weigl DM, Bar-On E, Katz K. Small-fragment wounds from explosive devices: need for and timing of fragment removal. J Pediatr Orthop. 2005 Mar-Apr. 25(2):158-61. [Medline]. Snell JA. The management of dirt ingraining in wounds. Med J Aust. 1968 Mar 9. 1(10):401-4. [Medline]. Brook JW. Management of pedal puncture wounds. J Foot Ankle Surg. 1994 Sep-Oct. 33(5):463-6. [Medline]. Chang HC, Verhoeven W, Chay WM. Rubber foreign bodies in puncture wounds of the foot in patients wearing rubber-soled shoes. Foot Ankle Int. 2001 May. 22(5):409-14. [Medline]. Hoffman DR, Jebson PJ, Steyers CM. Nail gun injuries of the hand. Am Fam Physician. 1997 Oct 15. 56(6):1643-6. [Medline]. Rockett MS, Gentile SC, Gudas CJ, et al. 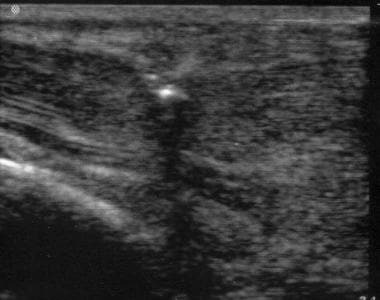 The use of ultrasonography for the detection of retained wooden foreign bodies in the foot. J Foot Ankle Surg. 1995 Sep-Oct. 34(5):478-84; discussion 510-1. [Medline]. Babashahi A, Taheri M. Kyphotic deformity after laminectomy surgery for a gunshot wound to the spine: a case report. J Spine Surg. 2016 Mar. 2 (1):64-8. [Medline]. Resnick CD, Fallat LM. Puncture wounds: therapeutic considerations and a new classification. J Foot Surg. 1990 Mar-Apr. 29(2):147-53. [Medline]. Thomas SH, Brown DFM. Foreign bodies. Marx JA, Hockberger RS, Walls RM, et al. Rosen's Emergency Medicine: Concepts and Clinical Practice. 6th ed. Philadelphia, Pa: Mosby Elsevier; 2006. Chap 57; 859-79. Ling SN, Ong NC, North JB. Eighty-seven cases of a nail gun injury to the extremity. Emerg Med Australas. 2013 Dec. 25(6):603-7. [Medline]. Capellan O, Hollander JE. Management of lacerations in the emergency department. Emerg Med Clin North Am. 2003 Feb. 21(1):205-31. [Medline]. Gammons MG, Jackson E. Fishhook removal. Am Fam Physician. 2001 Jun 1. 63(11):2231-6. [Medline]. Crystal CS, McArthur TJ, Harrison B. Anesthetic and procedural sedation techniques for wound management. Emerg Med Clin North Am. 2007 Feb. 25(1):41-71. [Medline]. Shiels WE. Soft tissue foreign bodies: sonographic diagnosis and therapeutic management. Ultrasound Clin. Oct 2007. 2(4):669-81. Stevenson TR, Thacker JG, Rodeheaver GT, Bacchetta C, Edgerton MT, Edlich RF. Cleansing the traumatic wound by high pressure syringe irrigation. JACEP. 1976 Jan. 5(1):17-21. [Medline]. Singer AJ, Hollander JE, Subramanian S, Malhotra AK, Villez PA. Pressure dynamics of various irrigation techniques commonly used in the emergency department. Ann Emerg Med. 1994 Jul. 24(1):36-40. [Medline]. Longmire AW, Broom LA, Burch J. 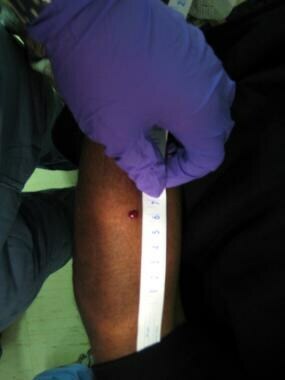 Wound infection following high-pressure syringe and needle irrigation. Am J Emerg Med. 1987 Mar. 5(2):179-81. [Medline]. Edlich RF, Rodeheaver GT, Morgan RF, Berman DE, Thacker JG. Principles of emergency wound management. Ann Emerg Med. 1988 Dec. 17(12):1284-302. [Medline]. Morse JW, Babson T, Camasso C, Bush AC, Blythe PA. Wound infection rate and irrigation pressure of two potential new wound irrigation devices: the port and the cap. Am J Emerg Med. 1998 Jan. 16(1):37-42. [Medline]. Riyat MS, Quinton DN. Tap water as a wound cleansing agent in accident and emergency. J Accid Emerg Med. 1997 May. 14(3):165-6. [Medline]. Dire DJ, Welsh AP. A comparison of wound irrigation solutions used in the emergency department. Ann Emerg Med. 1990 Jun. 19(6):704-8. [Medline]. Moscati RM, Reardon RF, Lerner EB, Mayrose J. Wound irrigation with tap water. Acad Emerg Med. 1998 Nov. 5(11):1076-80. [Medline]. Bansal BC, Wiebe RA, Perkins SD, Abramo TJ. Tap water for irrigation of lacerations. Am J Emerg Med. 2002 Sep. 20(5):469-72. [Medline]. Valente JH, Forti RJ, Freundlich LF, Zandieh SO, Crain EF. Wound irrigation in children: saline solution or tap water?. Ann Emerg Med. 2003 May. 41(5):609-16. [Medline]. Cooper ML, Laxer JA, Hansbrough JF. The cytotoxic effects of commonly used topical antimicrobial agents on human fibroblasts and keratinocytes. J Trauma. 1991 Jun. 31(6):775-82; discussion 782-4. [Medline]. Moscati R, Mayrose J, Fincher L, Jehle D. Comparison of normal saline with tap water for wound irrigation. Am J Emerg Med. 1998 Jul. 16(4):379-81. [Medline]. Blankstein A, Cohen I, Heiman Z, et al. Localization, detection and guided removal of soft tissue in the hands using sonography. Arch Orthop Trauma Surg. 2000. 120(9):514-7. [Medline]. Bocka JJ, Godfrey J. Emergency department use of an eye magnet for the removal of soft tissue foreign bodies. Ann Emerg Med. 1994 Feb. 23(2):350-1. [Medline]. Crawford R, Matheson AB. Clinical value of ultrasonography in the detection and removal of radiolucent foreign bodies. Injury. 1989 Nov. 20(6):341-3. [Medline]. Eggers G, Haag C, Hassfeld S. Image-guided removal of foreign bodies. Br J Oral Maxillofac Surg. 2005 Oct. 43(5):404-9. [Medline]. Gahhos F, Arons MS. Soft-tissue foreign body removal: management and presentation of a new technique. J Trauma. 1984 Apr. 24(4):340-1. [Medline]. Isaacson G. Two-stage removal of an impacted foreign body with an epoxied anchor. Ann Otol Rhinol Laryngol. 2003 Sep. 112(9 Pt 1):777-9. [Medline]. Shalaev SA, Chepcheruk GS, Abakumov VA, Kurygin AA. [The removal of soft-tissue foreign bodies after the puncture administration of a dye]. Vestn Khir Im I I Grek. 1993 Jul-Dec. 151(7-12):46. [Medline]. Shiels WE 2nd, Babcock DS, Wilson JL, et al. Localization and guided removal of soft-tissue foreign bodies with sonography. AJR Am J Roentgenol. 1990 Dec. 155(6):1277-81. [Medline]. Siessegger M, Mischkowski RA, Schneider BT, et al. Image guided surgical navigation for removal of foreign bodies in the head and neck. J Craniomaxillofac Surg. 2001 Dec. 29(6):321-5. [Medline]. Tan SS, Yeo MS, Lee G, Ho M, Ang ML, Lee W, et al. Penetrating foreign body in the masticator space with injury to the internal maxillary artery: a surgical challenge. Ann R Coll Surg Engl. 2016 Nov. 98 (8):e194-e196. [Medline]. Sersar SI, Albohiri KA, Abdelmohty H. Impacted thoracic foreign bodies after penetrating chest trauma. Asian Cardiovasc Thorac Ann. 2016 Sep 15. [Medline]. Enyuma CO, Offiong M, Adekanye A, Akpan U, Ezeanyagu N, Uffiah O. FOREIGN BODY IN THE NASOPHARYNX; MASQUERADING AS PHARYNGOTONSILLITIS. Niger J Med. 2015 Oct-Dec. 24 (4):380-3. [Medline]. Teng M, Doniger SJ. Subungual wooden splinter visualized with bedside sonography. Pediatr Emerg Care. 2012 Apr. 28(4):392-4. [Medline]. Bumpus K, Maier MA. The ABC's of wound care. Curr Cardiol Rep. 2013 Apr. 15(4):346. [Medline]. Halaas GW. Management of foreign bodies in the skin. Am Fam Physician. 2007 Sep 1. 76(5):683-8. [Medline]. Freeman BJ, Ainscow DA. Nail gun injury: an update. Injury. 1994 Mar. 25(2):110-1. [Medline]. O'Brien M, Hutton KA. Minimally invasive retrieval of a foreign body after penetrating soft tissue injury. J Trauma. 2005 Sep. 59(3):754-6. [Medline]. Howell JM, Chisholm CD. Wound care. Emerg Med Clin North Am. 1997 May. 15(2):417-25. [Medline]. Smoot EC, Robson MC. Acute management of foreign body injuries of the hand. Ann Emerg Med. 1983 Jul. 12(7):434-7. [Medline]. Tountas CP, Macdonald CJ, Artman R. Case report. Detection of foreign bodies in the hand utilizing xeroradiography. Minn Med. 1978 May. 61(5):296-7. [Medline]. Blankenship RB, Baker T. Imaging modalities in wounds and superficial skin infections. Emerg Med Clin North Am. 2007 Feb. 25(1):223-34. [Medline]. Bradley M. Image-guided soft-tissue foreign body extraction - success and pitfalls. Clin Radiol. 2012 Jun. 67(6):531-4. [Medline]. Ginsburg MJ, Ellis GL, Flom LL. Detection of soft-tissue foreign bodies by plain radiography, xerography, computed tomography, and ultrasonography. Ann Emerg Med. 1990 Jun. 19(6):701-3. [Medline]. Russell RC, Williamson DA, Sullivan JW, et al. Detection of foreign bodies in the hand. J Hand Surg [Am]. 1991 Jan. 16(1):2-11. [Medline]. Flom LL, Ellis GL. Radiologic evaluation of foreign bodies. Emerg Med Clin North Am. 1992 Feb. 10(1):163-77. [Medline]. Hess U, Harms J, Schneider A, et al. Assessment of gunshot bullet injuries with the use of magnetic resonance imaging. J Trauma. 2000 Oct. 49(4):704-9. [Medline]. Kim SW, Youn SK, Kim JT, Cho SH, Kim YH, Hwang KT. Management of an unusual craniofacial impalement injury by a metallic foreign body. J Craniofac Surg. 2012 Mar. 23(2):e140-6. [Medline]. Turkcuer I, Atilla R, Topacoglu H, et al. Do we really need plain and soft-tissue radiographies to detect radiolucent foreign bodies in the ED?. Am J Emerg Med. 2006 Nov. 24(7):763-8. [Medline]. Gilbert FJ, Campbell RS, Bayliss AP. The role of ultrasound in the detection of non-radiopaque foreign bodies. Clin Radiol. 1990 Feb. 41(2):109-12. [Medline]. Banerjee B, Das RK. Sonographic detection of foreign bodies of the extremities. Br J Radiol. 1991 Feb. 64(758):107-12. [Medline]. Friedman DI, Forti RJ, Wall SP, et al. The utility of bedside ultrasound and patient perception in detecting soft tissue foreign bodies in children. Pediatr Emerg Care. 2005 Aug. 21(8):487-92. [Medline]. American College of Emergency Physicians. Emergency ultrasound guidelines. Ann Emerg Med. 2009 Apr. 53(4):550-70. [Medline]. Jafari D, Berwald N, Hassan K, Khan F, Viswanathan N, Ardolic B. 308 Small Retained Foreign Bodies: What Is the Limit of Detection Using Current Emergency Ultrasonography Equipment?. Ann Emerg Med. 2012. 60(4):S110. Gooding GA, Hardiman T, Sumers M, et al. Sonography of the hand and foot in foreign body detection. J Ultrasound Med. 1987 Aug. 6(8):441-7. [Medline]. Jacobson JA, Powell A, Craig JG, Bouffard JA, van Holsbeeck MT. Wooden foreign bodies in soft tissue: detection at US. Radiology. 1998 Jan. 206(1):45-8. [Medline]. Robert Edward Mittendorff II, MD, MBA Consulting Staff, Permanente Medical Group, Kaiser Permanente, Diablo Group. Robert Edward Mittendorff, II, is a member of the following medical societies: American Medical Association and Society for Academic Emergency Medicine.